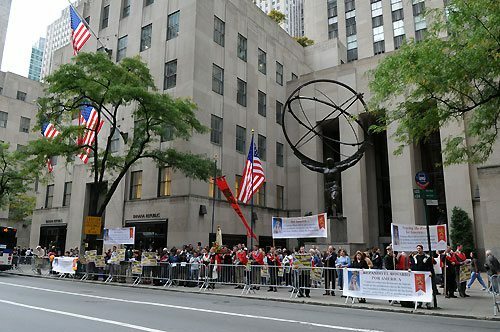 In looking for a place for a Public Square Rosary Rally, it is hard to find a more public place than Fifth Avenue. Every hour, tens of thousands of people walk up and down this most famous street as they go about their affairs. Tourists from all over the world fill the sidewalks so that the avenue is a public place not just for New York but the world. And when looking for a symbolic place on Fifth Avenue itself, there is nothing like the small square in front of Rockefeller Center, where that huge secular monument faces off with St. Patrick Cathedral right across the street. This was the site chosen for just one Public Square Rosary Rally for friends and members of the American Society for the Defense of Tradition Family and Property (TFP) and its America Needs Fatima campaign. Nearly 150 people gathered to pray the rosary on this most public of squares. The weather looked threatening all morning. However, the sun came out as the noontime event was about to begin. 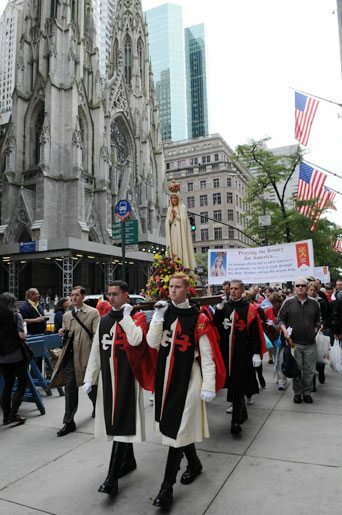 The rally began with a procession of a statue of Our Lady of Fatima escorted by four TFP members in ceremonial habit. Nothing could be more shocking than to see Our Lady take over the area. For nearly two hours, Our Lady reigned over one of the most valuable pieces of real estate in America. Procession of Our Lady with TFP members in ceremonial habit. The reactions on the busy sidewalks were varied. Some crossed themselves and even prayed along as they passed by the rally. Yet others feigned indifference while some looked with hostility at seeing Catholics manifesting themselves outside church doors. Several passersby actually joined the rally. 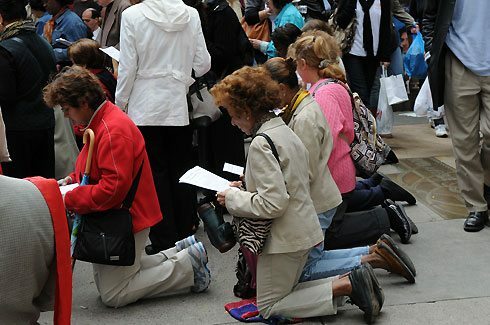 One of these was the pro-life film star Eduardo Verastegui, who stopped and prayed together with the crowd. There was joy in the air as America Needs Fatima president, Robert E. Ritchie led the rosary, prayers and songs that echoed off the tall buildings. Large banners and other signs clearly explained the intention of prayer for the conversion of America. Mr. Ritchie reminded the crowd that the rally was one of 4,337 similar rosary rallies across the country. The final prayer was the Consecration to the Blessed Virgin by Saint Louis de Montfort. Many of those in the crowd knelt for this prayer. Everyone was then invited to follow in procession as the statue of Our Lady was taken the one and a half blocks to the bus which would take her home. Praying the Consecration to Jesus through Mary by Saint Louis de Montfort. Now more than ever, the nation needs the rosary to address its grave ills. Catholics need to stand up for their Faith in the public square. And there are few opportunities to be more public than being with Our Lady on Fifth Avenue. This entry was posted in Events of 2009 and tagged America Needs Fatima, American Society for the Defense of Tradition Family and Property (TFP), bus, Consecration to the Blessed Virgin by Saint Louis de Montfort, Mr. Ritchie, nation, New York City, people, Public Square Rosary Rally, Rockefeller Center, rosary, sidewalks, With Our Lady on Fifth Avenue by John Horvat II. Bookmark the permalink.